This weekend, the Dofus players kept on their series of victories by winning their two weekly matches again, rising from a place in the rankings. Now in third place, they increase their chances to go to the DreamHack Tours to compete in the final phases of the competition. Only one more week before we know the four semi finalist teams, so we wish good luck to our Dofus team! The League of Legends players were the highlight of the week at GamersOrigin. They were fighting in the quarterfinals of the European Masters against exceL eSports, and won their first two matches in less than an hour, moving on in the competition towards the semifinals. After a first matchup in favor of GO that allowed our team to destroy the enemy Nexus in less than thirty minutes, a second confrontation made more balanced champions face each other. The red and blacks’ mastery of the game became unquestionable, especially for Tonerre and Toaster who didn’t die a single time through the two matches. We thank F1RE for helping BrokenShard and our LoL team in analysing the enemy strategy and the proceedings of the matches; he has been an essential actor of our victories throughout the European Masters. The team will hence go to Leicester next weekend to compete in the semifinals against Illuminar Gaming. 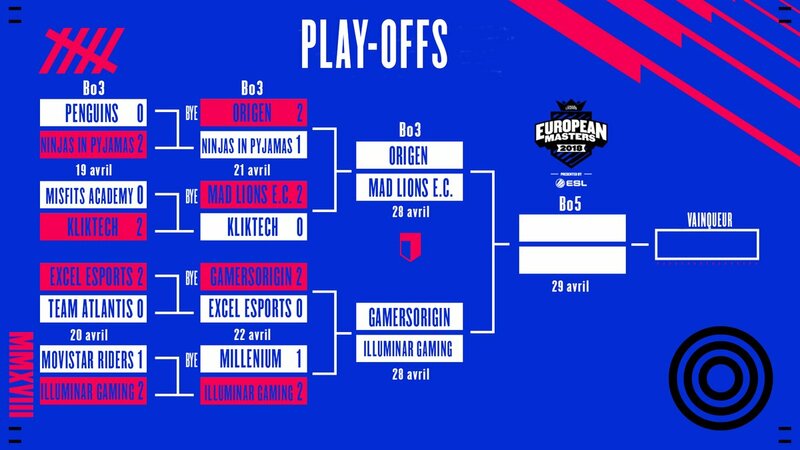 Following the defeat of Millenium in the quarterfinals, GamersOrigin is the only french team still running. We are proud to be able to represent France in an Europe-scaled competition, and to see our team rise so high in the tournament – thanks to all of you for your support along the matches and to have made of GO the favorites of our country! The semifinals will be played this saturday in England, in the Haymarket Theater of Leicester, before a live audience of 900. For this first edition of the European Masters, we hope we have marked people with the perfect score that our players managed to obtain. We already led France to the semifinals, and we hope to be able to bring home the trophy by the end of the weekend. #GOWIN!